Marketing is hard. Marketing is harder still for an early stage software, SaaS or hardware company. You are at a severe disadvantage in many respects vs. your larger, more established competitors: including brand, money, personnel resources and much more. One thing that can even the playing field is your expertise and knowledge, when coupled with a maniacal focus on the appropriate market segment and its pain points. A great way to overcome many of those disadvantages is to use the above attributes to establish a “thought leadership” position in your chosen segment. Executing this approach “in print” is a great content strategy for startups. You can reap the benefits of this thought leadership with a marketing approach that heavily utilizes content creation and has the side benefit of yielding great SEO benefits as well. There are two basic components to this marketing strategy: content creation and content distribution. We’ll take a look at content creation first. Unfortunately, success in content marketing and SEO doesn’t come overnight. In fact, it takes a while, so don’t count on it being the marketing approach that pays off the quickest. I’ve outlined some other approaches to kick start your startup marketing efforts in this article called Tech Marketing on a Shoestring Budget. Because it can take a while for content marketing to work, I’d advise that you get started on your content creation as early as possible. Even before you’ve started designing and building your product isn’t too soon! As long as you’ve defined your audience and have a basic idea of what you want to bring to market, you can start creating content aimed at that target audience. This will not only give you a head start and hopefully enable some SEO traffic already for when you do start to ship. You can also use the early readers of your content to bounce ideas off of, as well as serve as beta testers for your product concepts and early prototypes. Content strategy first: who are you trying to reach? 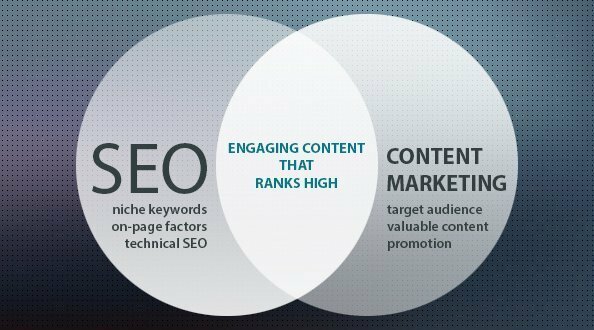 SEO and content marketing are serious topics when it comes to B2B marketing. The core piece of this strategy needs to be your company Blog. Your Blog should be serious business, even if not everyone views it that way. It’s easy to start blogging; some folks use a stream of consciousness approach, writing about whatever is on their mind that day. That’s kind of the social media parody/stereotype from the early days of Blogging, with people blogging about what they had for breakfast at the extreme. But blogging for business purposes is far different from that parody version of a Blog. In fact, business blogging should resemble the editorial process of a media company more than the personal, informal approach that occurs in personal and B2C blogging. I’m not suggesting that you can’t ever write anything informal, personal, spontaneous or glib. I think it’s fine to mix in some stuff that helps define the unique voice of your company. But in general, what you’re writing should be planned – laser-focused on, in fact – to attract your target audience. And your target audience is who you want to sell your products to, along with influencers in your ecosystem. Because of this the importance of correct targeting, it’s important to spend some time on strategy before you dive into writing. Once you’ve settled on your Blog content strategy, it’s best to be create a real process. Define your target audience, identify what is interesting to him/her as well as how that intersects with what you have to offer, both in knowledge and product. Once you have a good idea of the types of things it makes sense to write about, I recommend you formalize the process as much as possible. First you should decide how often you will be able to write. One great way of adding structure is to put together an actual editorial calendar, just like if you were creating an online magazine. Because that is in effect what you are trying to do: create a niche, online magazine laser-focused on the potential buyers of your product. Once you’ve established your ability to publish (daily, weekly, monthly, etc) go ahead and fill out your editorial calendar. Take it a step further and actually create outlines for each of your proposed articles. You may be sensing a theme here. Structure helps. Writing is a creative process, but if you go at it systematically, from the top down and fleshing things out from there, I find that it helps to make that daunting blank “sheet of paper” less intimidating. If there is more than one person involved, a brainstorming session to come up with potential articles is excellent way to start. This can be a great way to stimulate creativity (1+1=3 when in comes to idea generation), but also to vet and eliminate ideas which sound good initially in your head – but really aren’t! Even if it’s just you doing the writing, it’s still very useful to fill out your editorial calendar to the greatest extent possible (the next month, quarter, year, etc). This serves two purposes: 1) it creates an actionable plan that you can hold yourself accountable to and 2) allows you to scope out and set aside the time needed to make it happen. One of the common push-backs I get when suggesting this type of content strategy of startups is that many tech company management teams will say “we don’t have time for that”. Indeed, in startups, every hour is usually accounted for, and then some. However, for many startup companies this strategy can be important enough that it should be “all hands on deck” to make it successful. Because of that, if there is buy-in on the strategy, I recommend that the company involve as many good writers as possible in creating blog content. Not only will this add to the pool of creativity and quantity of content that can be created, but it also “spreads around the pain”, so that content creation is less burdensome on one or a small number of team members. The key to a successful content strategy for startups is actually creating great content! Imagine that. If you don’t do this, nothing else in your execution will matter much. Remember, you’re trying to build THOUGHT LEADERSHIP. I’m going to make an analogy here. I consider thought leadership to be the marketing equivalent to a technical feature advantage on the product side. And you KNOW how important having a product differential advantage is in a software, SaaS or hardware business. You can’t created this thought leadership with a bunch of quickly conceived, moderately interesting articles, no matter what the quantity. So my biggest rule is spend your time creating the amount of content that you can make GREAT. More is definitely better when it comes to content creation. But quality is paramount. So try to make every article something that you’re quite proud of. If you’re not proud of it, keep rewriting until you are, the editorial calendar be dammed. Your trying to create something that will position you and your company as the experts in your market segment. The payoff if you can accomplish this is high; it can put your product above far larger and more established companies in the eyes of your prospects and lead to real sales momentum. Folks want to buy things that credible experts have built. So do everything you can to make this happen. In my experience, time does matter when writing quality content. Sometimes things come to you in an inspirational moment and you can whip a great article out very quickly; especially if it’s a topic that you are already very knowledgeable and passionate about. But more often then not, the more times you go through an article, the better it becomes. Great writing is hard work, don’t try to take shortcuts. The potential payoff is too big. Another content strategy for startups recommendation I would give is to focus as much as possible on what I call evergreen, “how to” types of articles. A lot of people will focus on the “news of the day” in their writing, which is fine for its purpose. In the short term, you may get higher (sometimes much higher) readership with topics of current interest. The problem is that these articles quickly become dated or even obsolete. From my perspective, it is generally better to write articles that demonstrate your command of important topics, hopefully educate the reader, but also importantly stand the test of time. These types of article will have the longest SEO benefit, because people will seek them out and refer to these expert articles for years. It also means that you can promote them in an almost infinite loop through your content distribution channels, effectively building a large catalog of valuable content over time. Now, if you have something to say on some current event which touches your business, by all means go ahead and write about it! It’s great to mix these types of articles into your blog content. But just be aware that they won’t have the long term value of the evergreen-style articles. When you are allocating scarce, valuable bandwidth from your limited startup resources, long run ROI is important. Some would list this step higher up in a content strategy for startups process. Many content marketing experts counsel keyword research and selection as a first step, to ensure that you are maximizing the reach and targeting of your hard work in content creation. But I don’t do it that way. I like to write more “organically” first. I believe that the most important optimization is for your READERS; search engines are second. If you don’t write about topics that you are knowledgeable and passionate about and of great interest to your readers, the SEO stuff won’t matter much. So I like to do it “backwards” from this advice. I write my article first, then I do my keyword research based upon the content that I have created. I believe that this way your articles turn out more natural and less forced on a specific set of keywords. I’m sure that I’m giving up a bit looking at it from a strictly ‘best keywords” perspective, so there is a trade-off here. You can do it either way. But for me, I want to make sure that I’ve optimized for my readers, first and foremost. Once you’ve done your keyword research and written your article – in either order – you can then move on to on-page optimization. This is the exercise of attempting to ensure that Google and the other search engines will view your article with the same focus as your targeted keyword, giving the article the best chance of rising to the top of the search results page for your selected keywords. I won’t go into the mechanics of this process here. While important, it’s relatively straightforward and there is a lot of help available out there both in terms of how-to articles published on the topic as well as software tools to assist. If you have a WordPress blog I highly recommend the Yoast SEO Plugin to support your on-page SEO efforts. It is very comprehensive, easy-to-use and makes this part of the process a breeze to accomplish. After creating your content, the second part of your content marketing and SEO strategy kicks in: distribution. This is indeed very important. If you create a bunch of great content and no one reads it, what good is it? So while I consider the content creation aspect the more important and challenging segment of successful content marketing, the second part also needs to be executed well. It just happens to be easier, and if you know what you’re doing, much less time consuming. Put blog article links in your outbound marketing and prospect nurturing campaigns. And more – re-purpose and reuse your content anywhere and everywhere that you can think of. With your evergreen blog content, don’t just share it ONCE. Share it repeatedly over time; you can do this for YEARS into the future. The only caveat here is that some platforms are sensitive to duplicate content, so be sensible. Spread it out and don’t overdo it. There are a wide variety of social automation tools available to assist with the repetitive tasks of content distribution. Some are better than others and if you don’t use them wisely they can be dangerous. If you know what you are doing, however, it’s possible to get a huge productivity boost using some of these tools. So there’s my primer on SEO and content strategy for startups. Please enlighten us with your own experiences in this area by using the comment field below.